We were hired to clean up clients property that was a gas station years ago and had high levels of Hydrocarbons in the ground where the underground tanks were. Other options included digging out all the soil and paying to have it trucked away by an environmental service. We treated the soil with Petro Buster, soaked it well with water afterwards to force the product down into the affected area. Actually the rain we had worked even better. After a few weeks we had another lab test done and it came back below the acceptable level. That made us look good with our client because this approach was much cheaper! I really enjoyed working with you on this project and find reviewing all the Phase II study details interesting to develop a strategy for treatment. The old school process of digging huge holes and paying a lot of money to have it hauled away is not necessary anymore. With products like Petro Buster, we have the two punch effect where the Surfactant (Soap) is engineered to break the tension in the molecules between Petroleum and Water. It emulsifies the Petroleum and disburses it in water. The more water the more dilution, the lower the Parts Per Million. From there the 2nd punch is the Microbe action where they actually consume the Hydrocarbons as the plume is disbursed. Our product completely biodegrades to water, oxygen and carbon dioxide when done consuming the fractures of Petroleum / Hydrocarbons leaving no trace behind. Go Green Team! Great Customer Service Right From The Chat Online To Delivery! We were looking for a remediation product that could be used to clean a diesel spill in the ground at our Marina at the edge of the water. We found Petro Buster website and it said there was someone available for a Chat. I chatted with them and got all my questions answered right away. We ordered the 5 gal pails of concentrate and it arrived in 3 days through FedEx. We received email updates from both Petro Buster and FedEx until we received it. It has worked great on removing the diesel from the soil and since we have ordered a couple pails to have on hand for emergencies. I’m glad you took advantage of our online Chat feature because so many questions arise when people find our website and we can get the answers they need to them immediately as we did with you. I’m glad you were successful using Petro Buster in removing the Diesel Fuel from the Soil at your Marina. It can be stressful having Petroleum in the ground so close to water. Thanks for taking the time to give us a fantastic review and thank you for being a great customer! Bill Fligg, President, Petro Buster Inc. I was looking for a product to clean the oil stain in my concrete driveway and this one looked like it would work so I ordered it in the evening on Monday. I received an email from them within 20 minutes saying the order was ready to ship first thing in the morning. They gave me the tracking code so I could get updates until it arrived the 2nd business day later. I was surprised because these guys are in Ontario Canada and I am in New York, United States. Also when I got it as expected it worked great! We try very hard to monitor orders 24/7 and will email back right away. Many people call after hours and we call them back at night and on the weekends if they leave a message. When orders come in, if we can get the order delivery set before midnight, it saves 1 day in the process and that is what we did for your order. Thanks for giving us a great review and we’re happy to hear it cleaned your oil stain stain from your concrete driveway. I really appreciate your feedback about Petro Buster! Nice to hear you were able to get the oil stain out of the concrete and keep the peace at home 🙂 Feel free to contact us anytime. 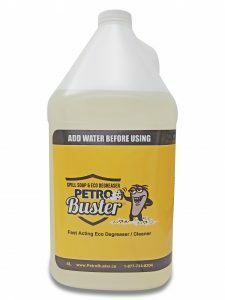 Remember Petro Buster can be used to clean a wide variety of things and something you might want to have around the house. We heat with oil and our tank outside leaked in the ground. We had a smell in the house and noticed the oil found it’s way to the basement in the sump. It smelled really strong like diesel fuel in the house and could not stand to be in there. We found the Petro Buster website and called for information. The person from Petro Buster had a lot of experience with oil spills from having worked in the industry and explained it probably went down into our weeping tile and then back in to the house from there. We were told to get the larger pail, dilute it with 4 parts water and pour it around the same area that the oil leaked outside and then run a garden hose on it until we saw the suds coming into our sump in the basement. We did exactly what they said and within an hour it had come through to the sump. Immediately the smell went away. Since then we dug a few holes and do not smell oil in the ground either. We are happy customers because that was a horrible experience and could have cost thousands to clean up. I would recommend Petro Buster to anyone in this type of situation. I really appreciate your feedback about Petro Buster. As you know from our conversation on the phone I do really take an interest in my customers situation and enjoy being able to use my 15+ years in the Petroleum Industry to be able to help, I’m glad everything worked out well for you. Feel free to contact us anytime. 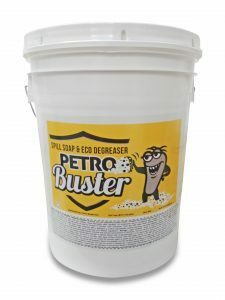 Remember Petro Buster can be used to clean a wide variety of things and something you might want to have around the house.